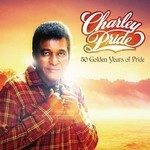 Country Music legend Charley Pride honours 5 decades of recording with a brand new greatest hits, '50 Golden Years Of Pride'. This comprehensive 52 track double CD features 18 US country numbers ones from his RCA years, along with the finest moments from his personally owned recordings of the last 2 decades. The compilation is the most complete career retrospective he has ever released and will only be available in Australia and New Zealand.